Researchers map how antidepressants lessen neuropathic pain. In the treatment of pain, a common course is to treat patients with opioid medications, these medications show limited effectiveness for neuropathic pain and come with safety and addiction issues. Because antidepressant medications are not addictive, they have become increasingly prescribed to treat neuropathic pain and related depression. Earlier research identified that antidepressants act in the spinal cord to control pain transmission, however, little is known about their pain-controlling actions in the brain. Now, a study from researchers at Mount Sinai has shown that commonly used antidepressant drugs change levels of a key signaling protein in the brain region that processes both pain and mood. The team state that the newly understood mechanism could yield insights into more precise future treatments for nerve pain and depression. The study is published in the Proceedings of the National Academy of Sciences (PNAS). Previous studies show that chronic neuropathic pain is often related to diabetes, infection or trauma and it persists even after the original source of the pain is gone. Such pain often leads to depression, however, brain mechanisms underlying this connection were previously unknown, as were the mechanisms by which common antidepressant drug classes -tricyclic (TCA) antidepressants or Selective Serotonin-Norepinephrine inhibitors (SNRIs), counter both pain and depression-related symptoms. The current study was conducted in mice suffering from chronic neuropathic pain. Results showed that the molecular adaptations required for recovery from pain and depression are controlled by a gene (RGS9), and the protein it codes for, named RGS9-2. The data findings showed that mice that lacked the gene responsible for encoding RGS9-2 responded much earlier to very low doses of antidepressants, showed significant improvement of sensory deficits and had no signs of depression-related behaviors. The current study shows that antidepressants that target monoamines, signaling chemicals in the brain that regulate chronic pain and depression, act in the nucleus accumbens, a part of the brain’s reward system, and likely through pathways that pass on messages to nerve cells through RGS9-2. The findings reveal that antidepressants that target specific neurotransmitters in the brain, particularly TCAs and SNRIs, regulate chronic pain and depression-related symptoms through actions in the nucleus accumbens. They team note that they don’t yet know if the typical pain-processing pathways in the spinal cord and the pathways they’ve identified in the brain reward center are directly linked. However, they go on to add that they now know more about the cellular pathways that need to be activated in order to achieve pain relief and that effective therapeutics must target both pathways. The lab surmise that they have found that the molecular pathways required for recovery from neuropathic pain are controlled by RGS9-2. They go on to conclude that by inhibiting RGS9-2, the function of hundreds of other molecules that are important for pain-relief and mood-elevation was boosted. For the future the team state their findings suggest that therapeutic treatments for neuropathic pain should target both the brain reward center as well as the previously identified pain-transmitting pathways in the spine. They go on to add that insight from this study will be used to develop new targets for the treatment of this debilitating disorder. GO and protein interaction network for the group comparison Rgs9WT SNI–DMI vs. Rgs9KO SNI–DMI. The list of genes from the comparison of Rgs9WT SNI–DMI vs. Rgs9KO SNI–DMI was also used to construct a possible protein interaction network using the STRING database and the high-confidence mode 0.07. 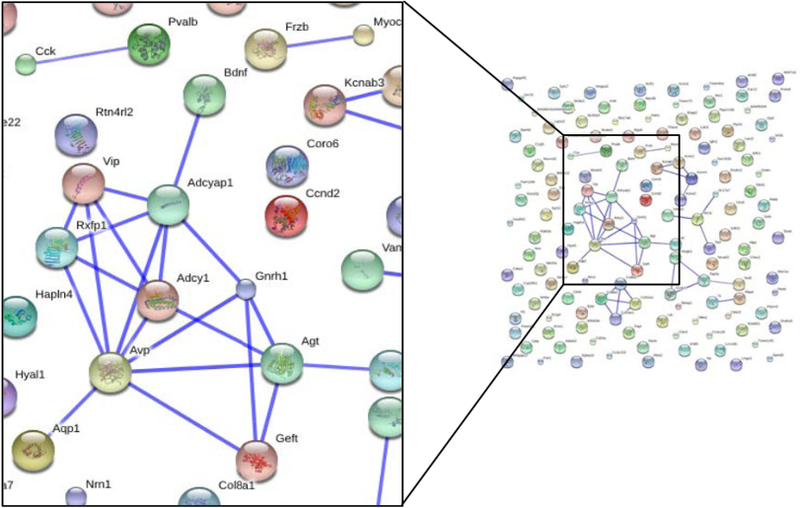 Although the network contains numerous individual nodes, there is a highly intercorrelated network in the center, involving genes abundant in the NAc and also relevant to chronic pain as well as antidepressant treatment. RGS9-2–controlled adaptations in the striatum determine the onset of action and efficacy of antidepressants in neuropathic pain states. Zachariou et al 2015.